Established by its bold and witty international acts, the Eden Comedy Club will be hosting its 7th Stand Up Comedy Night on Saturday 21 September at 8.30pm. 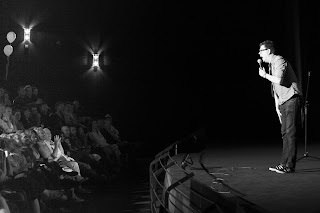 Taking place at the Eden Cinemas, audiences are in for a fantastic night with some of the best acts comedy has to offer. Bigger and louder each time, there is nothing quite like Eden Comedy stand up comedy night, so get booking Early bird tickets are available for a limited time only at just 15 euros – 25 per cent off the full price. The line-up for the night will feature top-notch acts spanning from across the globe, including our notorious headliner, Dana Alexander from Canada, known to be fierce and in your face. Also showcasing his tremendous talent is Martin Evans, who is often described as a cynical grouch with a sense of humour . Our third act on the night is Australian native Matt Dwyer who is sure to have the audience in absolute fits with his cheeky yet playful humour. Joining these three comedians is MC Matt Price whose lightning-fast mind will guarantee yet another terrific show. Staying true to our club motto - Entertain, Engage and Share the Laughter, the Eden Comedy Club promises to deliver an unforgettable show for all comedy-lovers out there that should definitely not be missed. Join the Eden Comedy Club for a brilliant night featuring some of the best comedic acts, together with food, beer and ample parking at the Eden Car Park. Taking place on a Saturday night, you’ve got a great excuse to really let go and have some fun.